KANANGA, Leyte – Leyte chief executives who attended the 39th Founding Anniversary of the 19th Infantry Battalion on Friday, October 19, 2012 cited before other guests the integrated efforts of LGUs and commandos towards sustaining peace and development in the province. In an evening social held at an Army camp based in Kananga, Leyte, chief executives figured out how 19th IB back the LGU’s quest to bring development for their constituents. Mayor Eric Codilla of Ormoc City recalled how startled he was when abandoned NPA camps were discovered by the soldiers at the outskirts of his town in 2006. “They even have tunnels connected in the vicinity of a certain hospital in Ormoc City which was believed to be the rebels’ passageway whenever they have casualties”, the three-termer mayor of Ormoc said. On the other hand, Mayor Maria Corazon Remandaban of Tabango, Leyte who is to host a Youth Leadership Summit before end of this month lauded the commandos for its continued support especially when 19IB conducts seminar on Disaster Rescue Operations to her constituents. Meanwhile, Mayor Elmer Codilla of Kananga, Leyte named 19IB as a close partner in various LGU undertakings in his town even up to present. 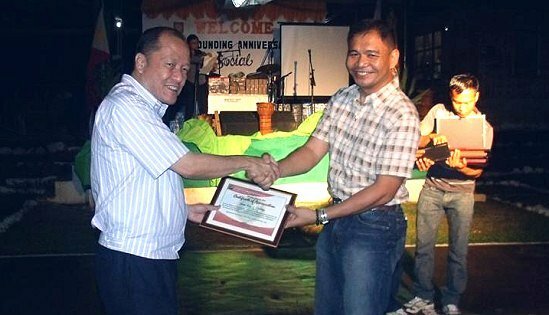 One of the celebrated accomplishments of 19IB and LGU Kananga was the surrender of former rebels and supporters during his second term as mayor. Lt. Col. Joel Alejandro Nacnac, commanding officer of 19IB was humbled by the feats cited by the chief executives. He was grateful that the LGUs in the area of responsibility of 19IB extended the same support given to the forerunners of the Leyte based Army battalion which remained in Leyte since 2001. In his anniversary message, Lt. Col. Nacnac stressed the significant feats of 19IB since he assumed command early January of this year. He also highlighted their week long activities which were conducted in commemoration to the same event. Likewise, he was confident that with the LGU’s strong leadership, remnants of the NPA rebels in Leyte will surrender and return to the folds of law before end of this year. QUEZON CITY – Greenpeace today called on the Philippine government to cancel all approvals of genetically-modified organisms (GMOs) following a landmark move in India which is expected to put a stop to all GMO experimental field trials in the sub-continent. The move – an official report submitted by the technical Expert committee set up by the Supreme Court of India comprising of India’s leading experts in molecular biology, toxicology and biodiversity – unanimously recommends a 10-year moratorium on all field trials of GM Bt food crops, due to serious safety concerns. The committee has also recommended a moratorium on field trials of herbicide tolerant crops until independent assessment of impact and suitability, and a ban on field trials of GM crops for which India is center of origin and diversity. “Unfortunately, while leading experts in India are recommending an end to GMOs, certain Filipino scientists who midnight as paid lackeys of agro-chemical corporations, are attempting to railroad GM field trials in the country – without the benefit of a comprehensive and objective study and analysis of safety data. The Department of Agriculture should be the first one to put a stop to such indiscriminate promotion of GMOs as it goes against the interest of Filipino farmers and consumers,” he added. The India Supreme Court report said that the moratorium was necessary because of the potential harm GM crops can cause to human health, and biodiversity. They also warned of the possibility that field trials will contaminate regular crops and our food supply. The expert body believes that India’s current regulatory system to assess the safety of GM crops is inadequate and raises questions about the ability to safely conduct field trials. The paper also raises concerns on conflict of interest within India’s GMO regulatory body. Among the most significant recommendations were: the need for independent, long-term and inter-generational studies in the biosafety risk assessment; a need assessment of the GM crop technology; and a socioeconomic risk analysis before open releases are permitted. The Philippines has never rejected approval of any GMO – even those GMOs which are banned in other countries due to health and safety concerns. Alarmingly, the government's system of regulation and assessment of the safety of GMOs remains largely closed to the public. Since 2004 the Department of Agriculture, through the Bureau of Plant Industry (BPI), has approved 67 GMOs for importation as food, feed and processing. The most worrisome GMO approvals are for rice – the country’s staple food. Greenpeace is challenging the country’s GMO regulatory system. Last April, the environment group filed a petition for a Writ of Kalikasan and Writ of Continuing Mandamus against Bt eggplant field trials in the Philippines. The hearings for the Writ of Continuing Mandamus are currently ongoing. “The Philippine Department of Agriculture (DA) should cancel all GMO approvals, including experimental field trials. It is a fact that the GMO regulatory system for in the Philippines is hopelessly flawed. With the growing opposition against GMO crops and the increasing body of scientific research that underlines the threats of GMOs, the government must wake up and create policies that look after the interests of the people. The DA has taken the first step Organic Agriculture Act of 2010, but this effort continues to be undermined by continued approvals of GMOs, as well as support of commercial research and field trials to propagate these harmful modified crops,” Ocampo concluded. CAMP LUKBAN, Catbalogan City – Four (4) army soldiers from 43rd Infantry Battalion, 8th Infantry Division, Philippine Army conducting Bayanihan Activities were killed in an armed encounter against the NPAs at vicinity Brgy Ramon, Gandara, Samar yesterday October 21, 2012 around 10:30 in the evening. Another two (2) soldiers were also wounded in the same armed encounter which lasted for about 30 minutes while undetermined number of casualties were recorded on the enemy side. The soldier heroes were members of the ‘Bayanihan Teams’ performing Peace and Development Activities in close coordination and collaboration with the local government unit of the Municipality of Gandara, Samar. “I personally extend my deepest sympathies to the families and friends of those killed. They were killed while protecting the Filipino people and in pursuit of peace and development in the area” said MGen Gerardo T Layug AFP, Commander, 8ID, PA.
“The heroic deeds of my men will steel our resolve in pursuing peace and development in the area, that their ultimate sacrifice will not be in vain” added Layug. “Despite the loss of lives of my men, we will pursue our efforts in conducting Peace and Development Activities to assist the local government attain Peace and Development not only in the Municipality of Gandara but in the whole area of operations of 43IB” LtCol Glen Jun Calambuhay, Commander, 43IB said. MANILA – The country's largest environmental coalition slammed the recent arrest of an anti-mining activist in Cagayan province using a Facebook post as main evidence for a libel suit. In a statement, the Green Convergence for Safe Food, Healthy Environment and Sustainable Economy (Green Convergence) condemned the arrest of Esperlita Garcia for the facts that she stated in Facebook about the destructive black sand mining in Gonzaga municipality and the local authorities' unbecoming behavior in dealing with those who oppose mining. "What is the basis of this arrest? Publicizing information is not libelous and should not be stopped whether it appears in print or online," said Marie Marciano, vice president of Green Convergence. "Surely, the Cybercrime Prevention Law does not mean to prevent such publication. If this Law were the purported basis for her arrest, the judge who issued the warrant for her arrest should have known that the Law has not taken effect as the Supreme Court has issued a 120-day Temporary Restraining Order on it," Marciano added, emphasizing, "Garcia's arrest is clearly illegal and should not be tolerated by the Department of Justice nor by any freedom-loving Filipino." Garcia is president of the Gonzaga Alliance for Environmental Protection and Preservation (GAEPP), a network-member of the Federation of Environmental Advocates in Cagayan Province (FEAC) and of the national alliance pushing for mining policy reforms, the Alyansa Tigil Mina (ATM). Garcia is also a member of the board of trustees of Save Sierra Madre Network Alliance (SSMNA). Both ATM and SSMNA are members of Green Convergence. "In view of climate change, it is criminal to minimize by even an inch the stretch of land that serves as buffer between human settlements and the rising sea level," explained Dr. Angelina Galang, environment professor at Miriam College and President of Green Convergence. Galang said that it is terrible enough that local officials have been approving such business ventures which benefit only foreign countries where our land will be exported. "To arrest a citizen who has been fighting against this activity and spreading awareness on the harm it has done is a great disservice to our country," she lamented. "Green Convergence, therefore, supports Esperlita Garcia in her brave campaign for our country’s environment and we call on President Benigno Aquino and the relevant government agencies to stop this obvious harassment and to correct this great injustice," Galang concluded. TACLOBAN CITY – Leyte Gov. Carlos Jericho Petilla said Kalahi-CIDSS principles provide the very essence of how his governance and project implementation under his three-term administration in the province of Leyte. This the governor stressed during the turn-over of a Kalahi-CIDSS school building project funded by the Millennium Challenge Corporation in Brgy. Sta. Elena, Lapaz, Leyte recently. “We have been very supportive of Kalahi-CIDSS as it mirrors our idea of a community driven development. The projects are identified by the communities and the implementation is done by the people themselves. This is actually the same process that we have been doing for our community development projects in Leyte,” Gov. Petilla told the mission. The governor likewise disclosed that he approved the counterparting scheme employed by Kalahi-CIDDS for each of the project implemented. 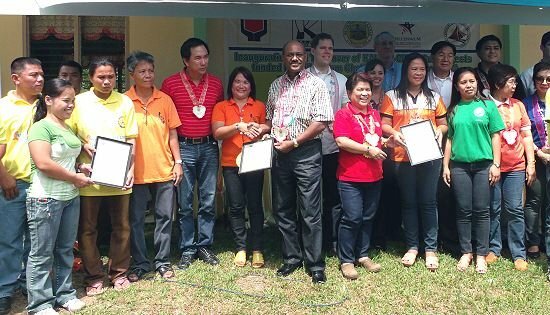 MCC CEO Daniel Yohannes, together with DSWD Secretary Dinky Soliman, led the inauguration of a one-classroom school building in Barangay Sta. Elena in La Paz, Leyte, one of 11 completed KALAHI-CIDSS sub-projects turned over to the barangays during the CEO’s visit to the municipality. The other sub-projects consist of five concrete pathwalks/tirepath with a total length of 1,190 meters; 2 Level 1 pump-driven water supply systems; two drainage canals with a total of 758 linear meters; and one concrete box culvert of 11 linear meters. Total cost of the sub-projects amounted to P5.3 million with P1.28 million covered by local counterpart and the rest by the MCC grant. The sub-projects are expected to benefit 1,081 households in the municipality. KALAHI-CIDSS, a community-based rural development program for poor communities, is one of three projects in the Philippines funded by the US Government under MCC. Kalahi-CIDSS seeks to empower communities in targeted poor municipalities to achieve improved access to sustainable basic public services and to participate in more inclusive LGU planning and budgeting. TACLOBAN CITY – Leyte Gov. Carlos Jericho Petilla said the private sector still remains to be the main driver for local economic development as well as the growth of small and medium enterprise in the province and the region. “Eversince, I have espoused that the government is a ‘poor businessman’. And that it cannot in any way compete with the private sector. The government can only act as support to any local economic development as well as the growth of small and medium enterprise,” Gov. Petilla said. Highlights of the program included a presentation of business opportunities for MSMEs and LGUs by cooperating national government agencies, one-on-one consultation by MSMEs and LGUs who wish to avail services offered by agencies, giving of special awards to PSP-SMEDSEP stakeholders who made a major and significant contribution to PSP-SMEDSEP success stories and gains in Leyte; signing of covenant of commitment and support to celebrate the long partnership among key PSP-SMEDSEP players for the development of the MSMEs in the province. The program involves planning, developing and implementing promotion models for small enterprise development and competitiveness, according to Belas. The DTI and SMEDSEP have also worked together in other development initiatives such as the simplification of business registration process, cash flow based lending, private sector provision of business development services and promotion of value chains. SMEDSEP contributes to the efforts of the Philippine government to improve the framework conditions for private sector development in the country. It is implemented in partnership with the DTI at the national, regional and provincial levels on behalf of the Philippine government and the German Federal Ministry for Economic Cooperation and Development (BMZ). In 2003, The Philippine government, in partnership with the Federal Republic of Germany, initiated a private sector promotion program to create a more favourable business environment for MSMEs in the Visayas. In time this program became popularly known as PSP SMEDSEP. At the national level, PSP SMEDSEP’s advisory service helped shape the 2011 to 2016 National Strategy for MSME Development which has been adopted by the Philippine Development Plan of the Aquino Administration. CARIGARA, Leyte – The Department of Public Works and Highways 2nd Leyte Engineering District, topped the collection of testing fees in September 2012 among the 12 District offices in Eastern Visayas. This was learned during the recently-held monthly meeting of the 2nd LED section chiefs with District Engineer Margarita C. Junia. Engr. Junia attributed the good collection performance which exceeded even the collection of the Regional Office, to the acquisition of new equipment..
From January to August 2012, the 2nd LED has generated P525,570 from fees and charges in laboratory, higher than the P489,000 collected by the regional office during the same period. Meanwhile, the lady engineer revealed that her office will conduct an inventory of equipments in line with the plan of the DPWH Central Office to replace old equipments. “Priority for replacement are equipments that have been used for 40 years or more. We really need new ones so we can efficiently deliver services,” Junia said. The 2nd LED ensures that the laboratory’s operation adheres to the guidelines formulated by the Bureau of Equipment with regards to utilization of equipment required by various infrastructure projects, equipment leasing, conduct of research on modern brands and models of equipment, performance and operation, and administering the rental management system, Junia added. CAMP SEC. RUPERTO K. KANGLEON, Palo, Leyte – The Police Regional Office 8 has expanded its one-strike policy from illegal gambling to illegal logging. “This will ensure that our police units would also go after illegal loggers and this will keep police chiefs on their toes’, said Police Chief Superintendent Elmer Ragadio Soria, PRO8 regional director. Soria added that the one-strike policy sought to reinforce and invigorate efforts against illegal logging by clearly defining leadership responsibilities of lower unit police commanders. PRO8 is strictly implementing Executive Order 23 “Declaring a Moratorium on the Cutting and Harvesting of Timber in the Natural and Residual Forests and Creating the Anti-Illegal Logging Task Force”, in coordination with the Department of Environment and Natural Resources leading to successful police operations against illegal logging activities. “While there are no logging concessions in the region, police efforts to neutralize the presence of small time loggers resulted in 369 operations conducted, the arrest of 114 persons and confiscation of an estimated total of 136,355.82 board-feet of assorted lumber worth P4,082,951.65 from January 1 this year to date’”, Soria reported. “The creation of Task Force “Kalibungan” (Kalikasan Teams) by this office and the firm directive to all police units to conduct relentless drive against illegal logging have lessened these nefarious activities.”, he averred. Comparing PRO8’s accomplishment this year to the same period of last year, there is an increase of 24 or 27% on persons arrested and an increase of P657,781.10 or 19% on worth of lumbers confiscated. Aside from sustained anti-illegal logging drive, the top police official also presented his office’ accomplishment to the PNP’s “Pulis Makakalikasan: 10 Milyong Puno Pamana sa Kinabukasan” program, the PNP’s tree planting program aiming to plant 10 million tree’s by February 2013 in exemplifying its organizational core value of being “makakalikasan”. “Our policemen have planted a total of 418,886 seedlings or 94.85% compliance to the Chief PNP’s directive”, he noted. By including illegal logging under the one-strike policy and the religious compliance to the PNP’s tree planting campaign, Soria is personally assuming a commanding role in environment protection initiatives in the region. QUEZON CITY – The Associated Labor Unions-Trade Union Congress of the Philippines (ALU-TUCP) today expressed grave concern over the Department of Health (DOH) findings the other day confirming the Liquified Petroleum Gas converted taxis poses health hazard to thousands of cab drivers and commuters. The ALU suggests that government should respond by activating quickly its existing inter-agency health task force previously assembled to deal with potential and emerging health problem in dealing with this particular issue. “We want to see, as soon as possible, an inter-agency health task force made up of people from the DENR, the LTFRB, the DTI, and the DOH on the ground inspecting LPG conversion shops and taxi terminals. We want the inter-agency team to interview affected taxi drivers and draw measures to permanently stop this man-made pandemic,” he added. Taxi drivers depend solely on their daily wages. They are categorized as part of the informal workers’ sector who don’t have social protection nor health benefits. Thus, the more the government should ensure that this new found health problems caused by exposure to LPG must be dealt with high urgency so that no one will have to endure further, he said. “On one hand, we also urge the taxi operators to cease denial. They must heed the findings and cooperate conscientiously with the authorities to rectify this emerging health problem,” Seno also stressed. The study was conducted by the DOH-NCR and the Rapid Assessment for Monitoring Exposure Risks in Conventional and Alternative Fuel Use Among the Public Transport Sector Study and the UP-National Poison Management and Control Center (UP-NPMCC) on 28 and 25 taxi drivers that uses LPG and regular gas/diesel fuel. Of those exposed in LPG, 26 complained of headaches, back pain, nape pain, chest pain, cough, dizziness, dry throat, fatigue and muscle weakness, nausea and difficulty in breathing. There are 40,000 registered taxi cabs in the country. Half of the figure are converted into LPG fuel and operate mostly in Metro Manila.